Welcome to our home and welcome to coziness. Cuz that’s the look I’m going for. Oh can you tell I’m always trying to go for coziness? Yeah, it’s kinda my thing, and probably yours too, right? I’m mean why not? When you come home, I think we all want to be cozy so that’s like the over all theme I’m always going for. Have I already told you that? Hmmm, maybe. I have to say, I do often repeat myself many times, it’s just cuz I got so much to say, and sometimes I’m not sure who’s heard it all, so I repeat at times. Well let me explain the theme. It’s not White Christmas. No, no, no, no, no, no. It’s gotta have the dreaming part cuz there ain’t no snow here in the middle of California where we’re at. So I dream of snow, dream of a White Christmas and frankly, the movie White Christmas is just my all time favorite movie ever! So, I’m decorating our home like the movie, like that old farmhouse that got turned into an old cottage-y ski lodge. Even a few years back when we had finally decided we would get new furniture, I searched and searched and told furniture sales people what I was looking for. I said, “I want a wing back chair that I’m sure Bing Crosby would sit in from the movie White Christmas!” They were stumped and some had never even seen the movie. What?! Crazy?! If you haven’t either, please do, this December! I know you’ll love it! So we have a flocked tree (you know I’m going for that snow thing) so it really works. I love the size and the shape and how it sits in front of our window so you can see it outside shining so bright. 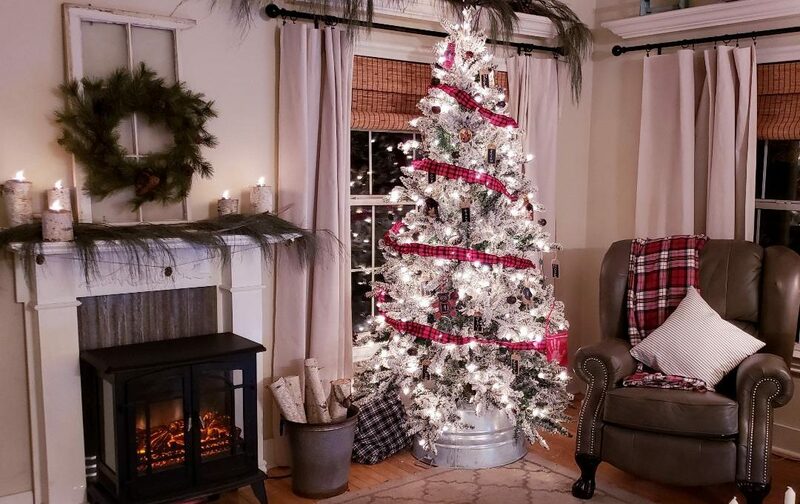 We got it at Walmart (click here for link) and it came all lit up -so that’s great – and being our first ever “fake” tree, I am really impressed! We just put it in a galvanized tub so you don’t see the stand. 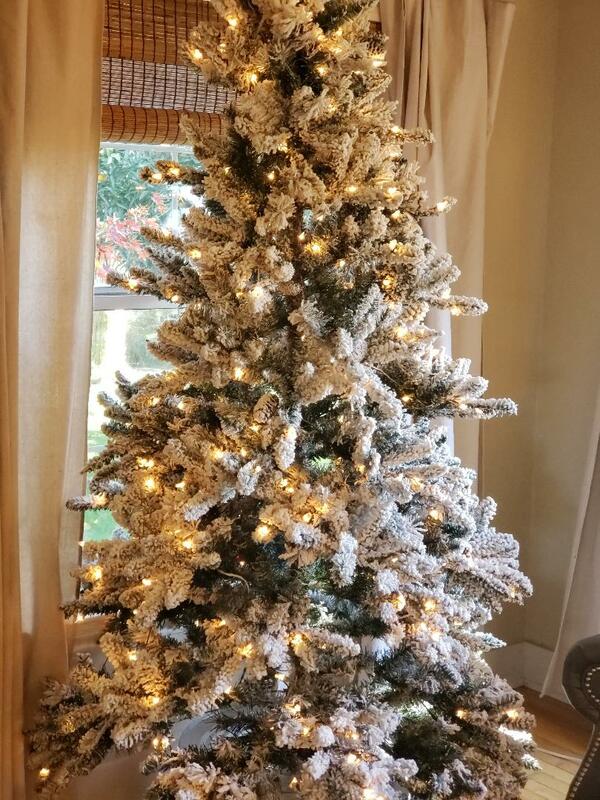 We always loved going to pick out a fresh tree, but once we became empty-nesters, we thought we’d graduated in getting this flocked one, so ta da, here it is! 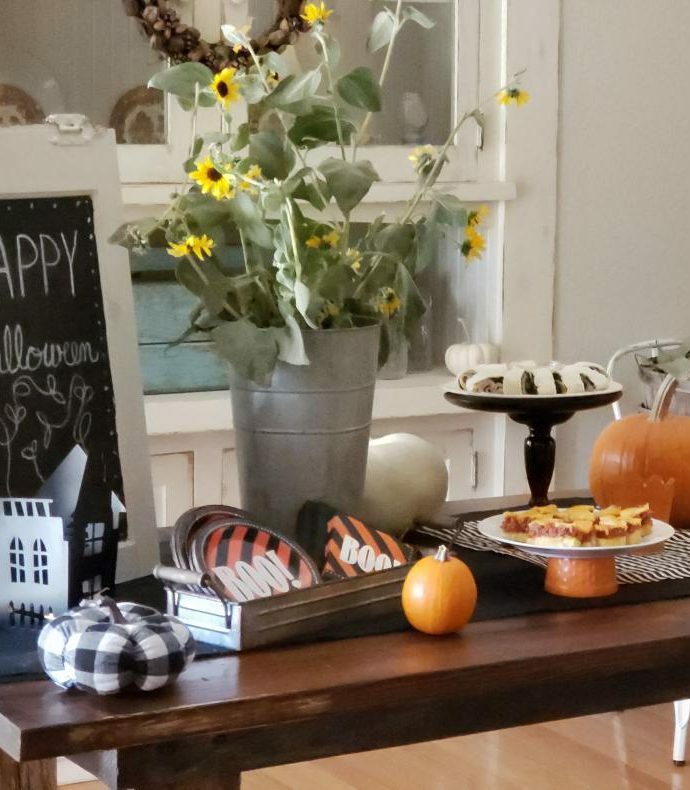 To capture my “Farmhouse” look, I started off with this red and black plaid ribbon. 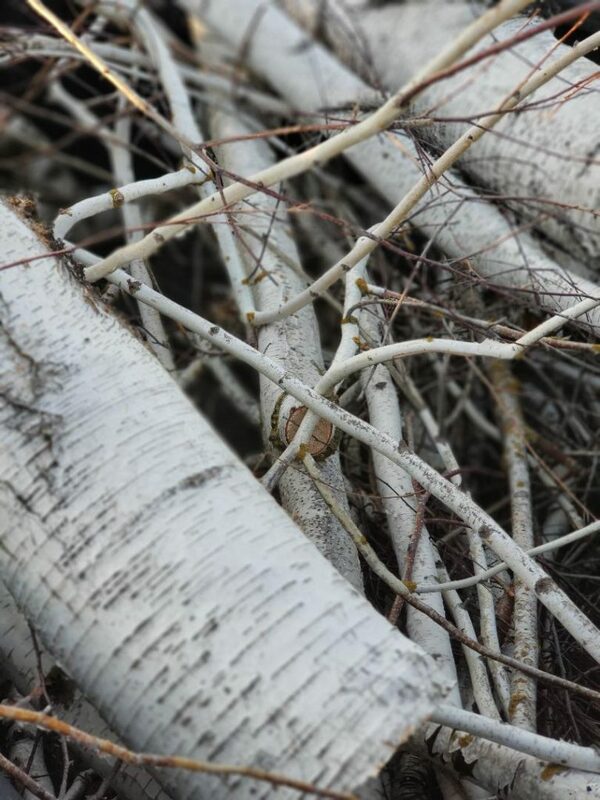 I love the way it screams merry and bright amongst the snow white branches. I added some antique looking jingle bells in a muted brown, red, and green color that I found at Target. 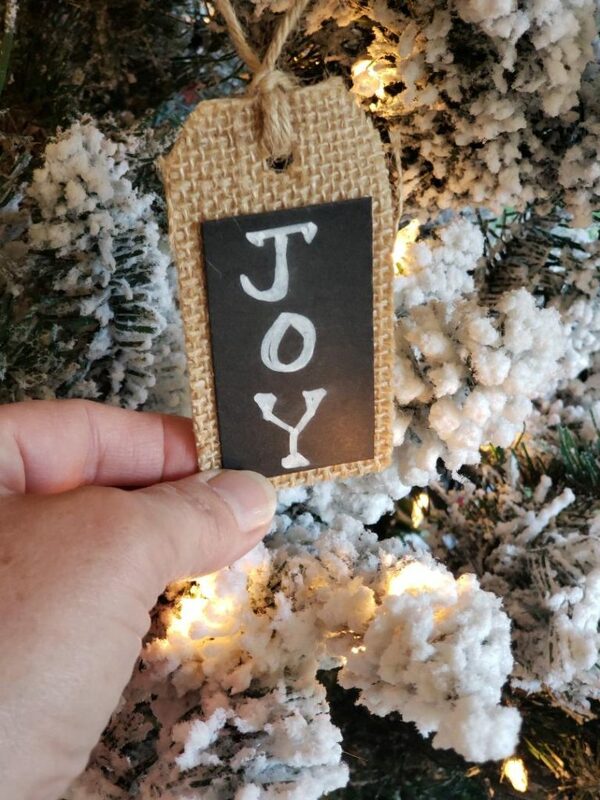 Next, I added these really cute burlap and chalk board ornaments that I made. I wrote on all of them what we are thinkin and focusin on this Advent like, HOPE, FAITH, JOY, PEACE, and it really is all about LOVE! Aren’t they so cute?! 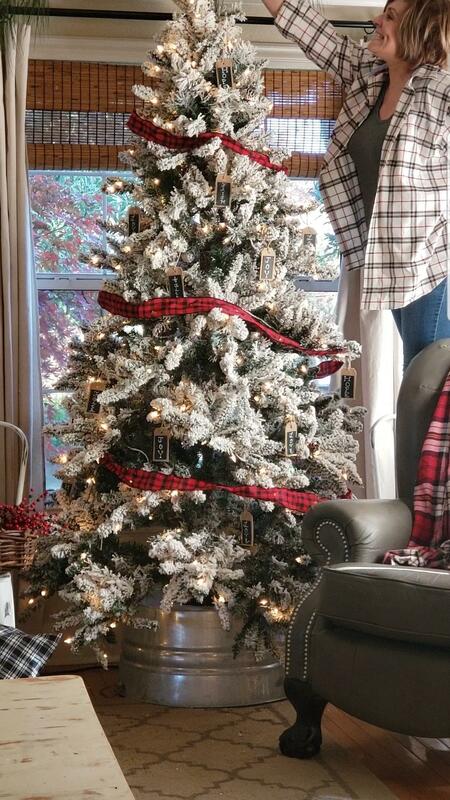 Don’t they just add the right amount of pop that goes with the red plaid and the white tree?! I know right? They were really easy to make too! First I cut some tan kraft paper into a tag form. 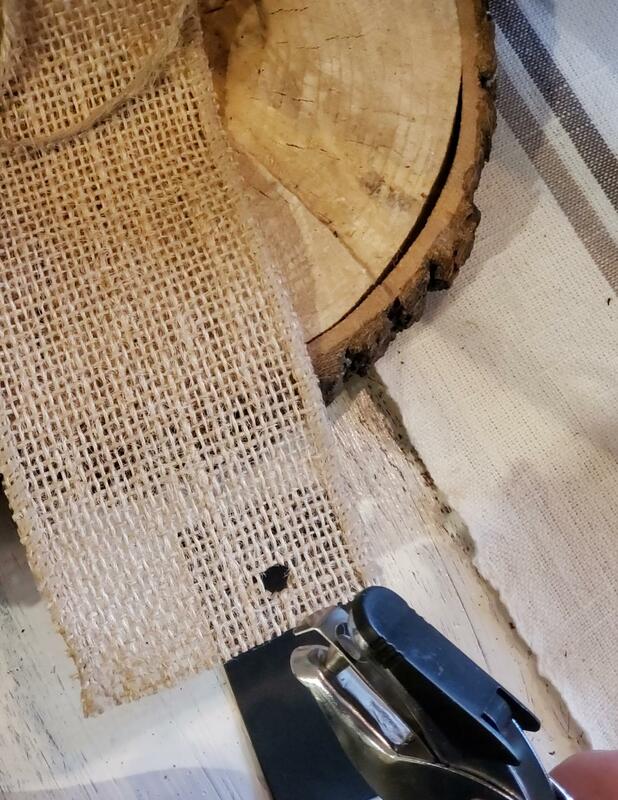 Then I punched a hole in it at the top and cut out some burlap the same shape and size. 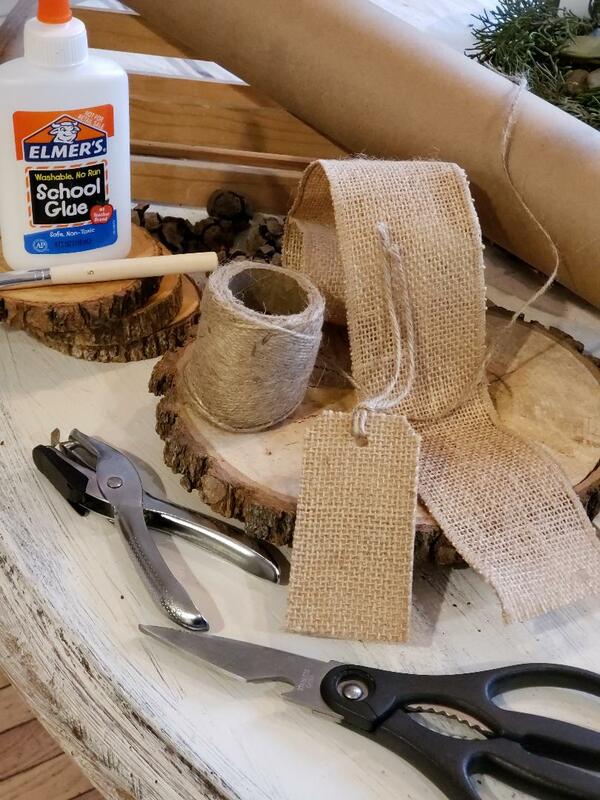 Next, I glued the burlap to the paper and tied some jute twine through the hole. I then cut out black paper a little smaller, and glued that on the front. 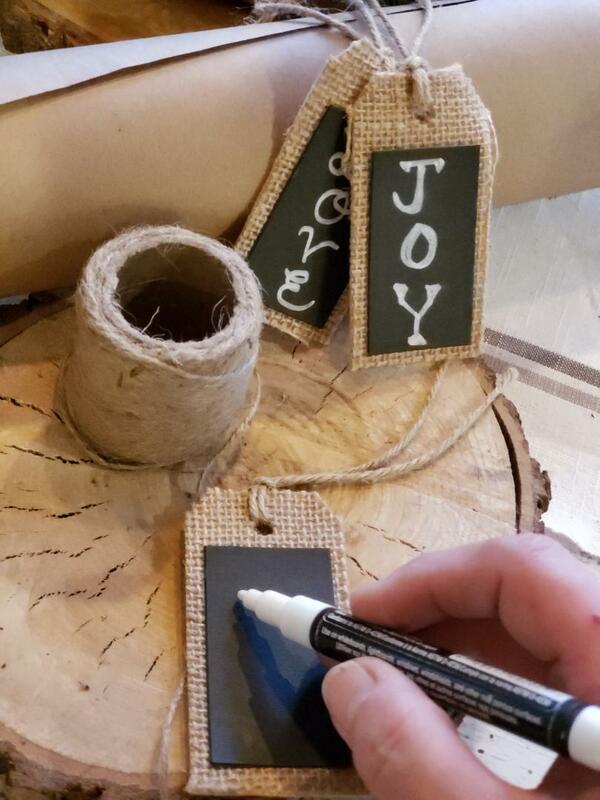 Taking my handy dandy chalkboard sign pen and writing down what inspires me on these little ornaments was the final touch! 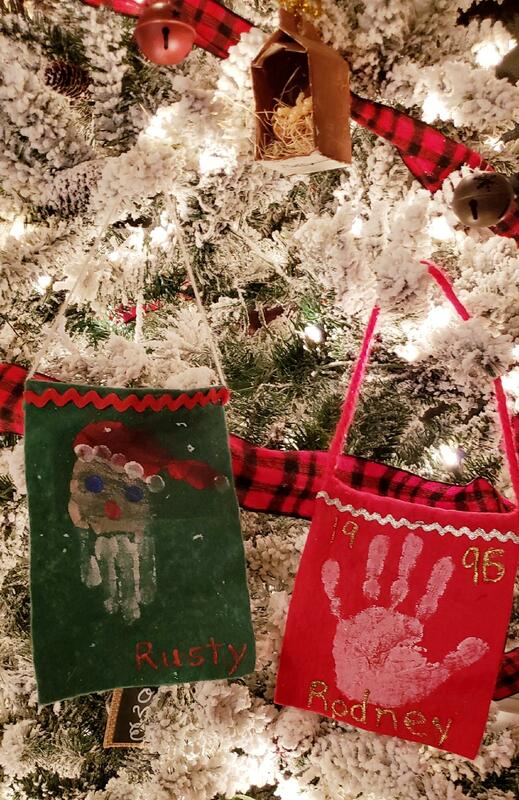 But my most favorite ornaments are the ones that our boys’ made in their little catechism classes when they were little, like these manger scenes made out of milk cartons and then these hand prints on felt from school. In fact, I always love to place these particular ones on the side of the tree right by me in my chair, so I can always look over at them and remember their hands were once that tiny. 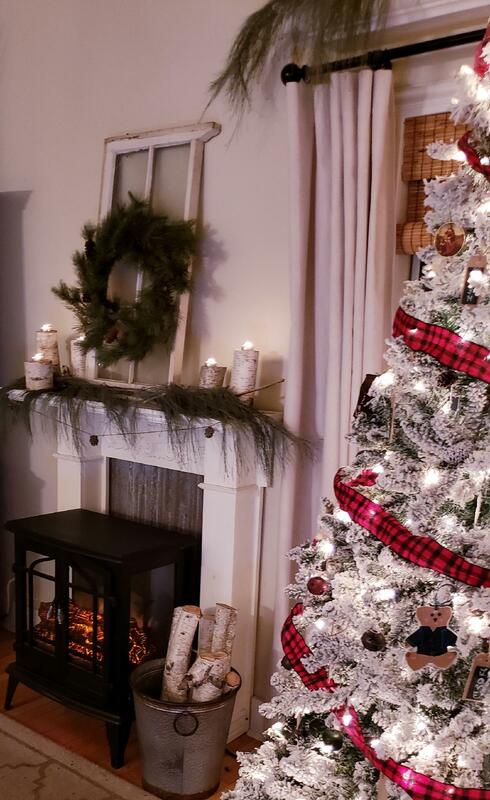 Along with the fresh garland outside on our porch (click here to see that post) I added some more above the tree on this upper shelf and also on the mantle too! 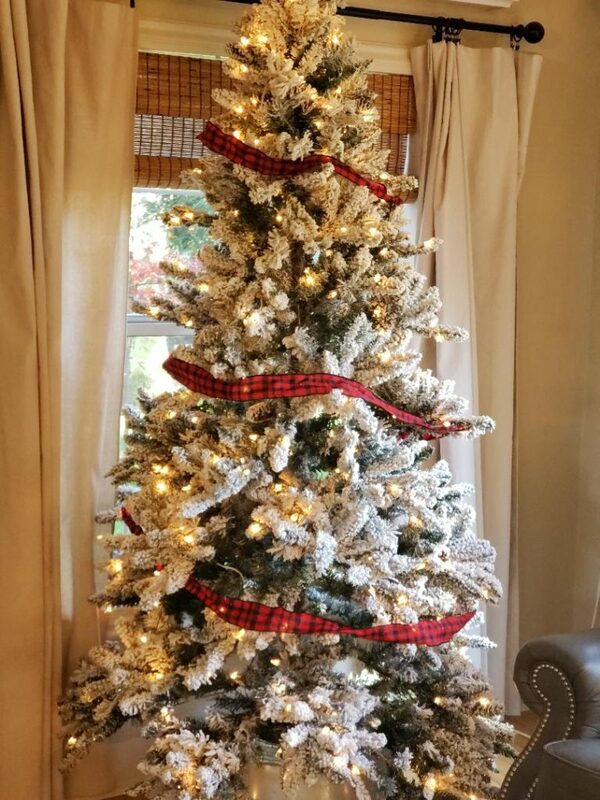 It really brought in that fresh Christmas Tree pine smell that I love so much and since we don’t have a fresh tree this year, I feel like it helps with what I love so much about the real trees. Then I added some pine cones scattered about on the ledge and I scented them myself so I could bring in some more of the wonderful smells of Christmas. Since I gathered these pine cones from our lil’ farm out back, I brought them in and I needed to freshen them up and debug em before use. It’s super easy, you just set them on a foil lined cookie sheet and bake them in a preheated 200 degree oven for 30 minutes. I let them rest a couple of days and then I can use them for crafts. 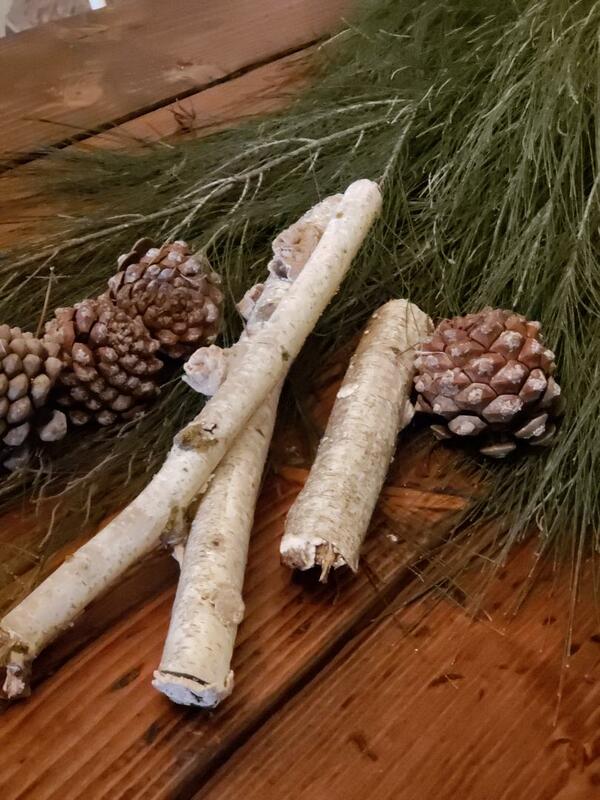 But for these I wanted to make my own scented pine cones. I’m just not quite sure what has been used on the ones you can find at the stores and they always seem to be too strong smelling. 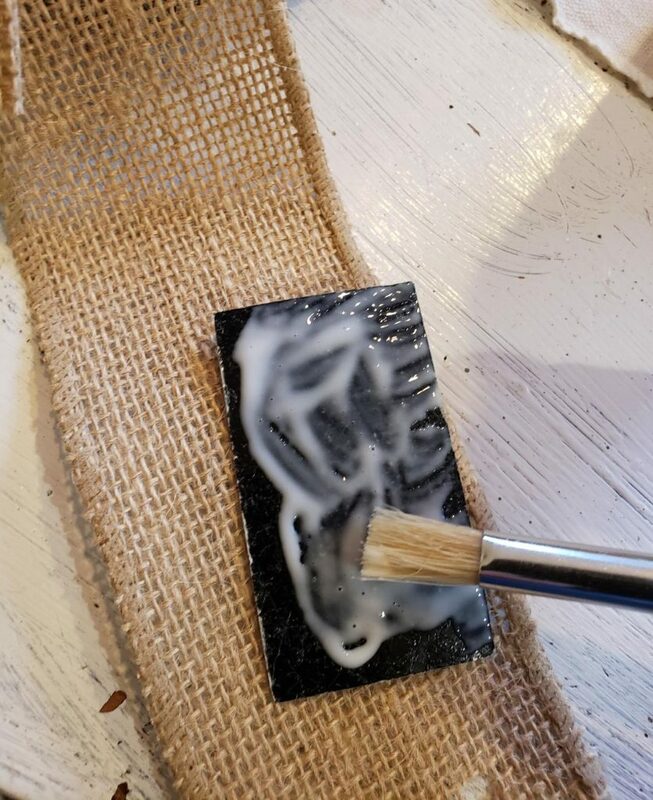 By doing this myself I know I’ll be using natural essential oils and can control the strength of the fragrance to my liking. 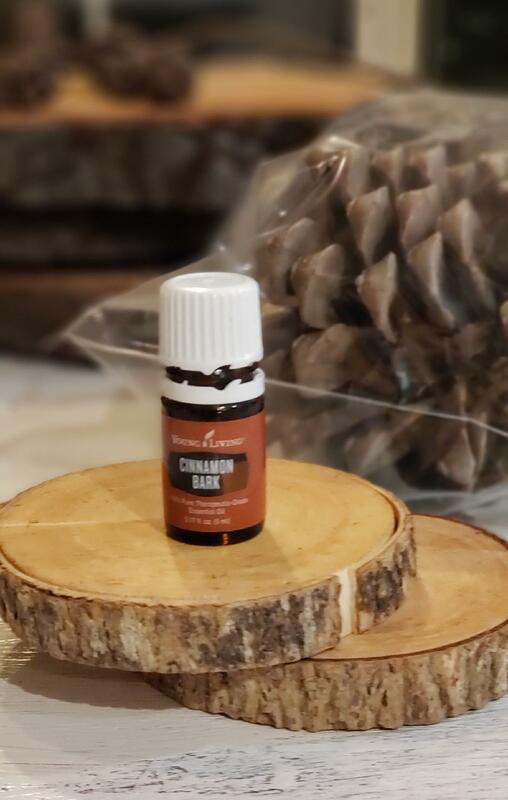 My friend Leslee supplies me with essential oils and for this project I used 30 drops of Cinnamon Bark (click here for link to get your own essential oils) that I put into a gallon sized resealable bag and I placed my pine cones in it. I left them in there over night, but the longer you leave them in the better. It’s also great to put them in the bag again when you need a refresher. Oh the smells friend, the smells! It’s so Christmas-y, so festive, and yes very cozy! 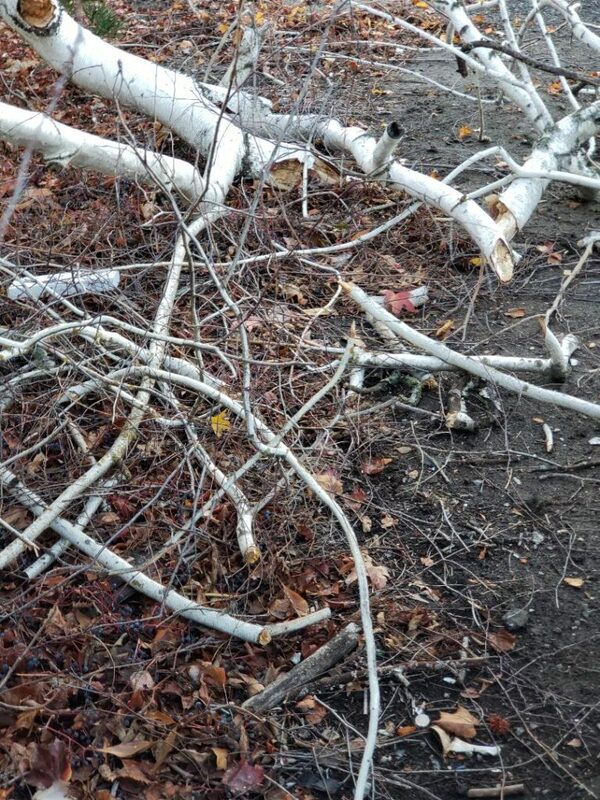 So this theme also popped into my head because lo and behold, my husband found this pile of none other than scattered “white” birch wood tree branches after a storm. So we of course, pulled over and loaded them all up cuz we knew we could do something amazing with them. I thought they might be great as candelabras on our fire place mantle! Rod, (my hubby) cut them down to different height sizes for a little interest and I set them up here on the mantle with little tea lights. Oh, look how pretty it looks especially all lit up in the evening where it really is aglow! 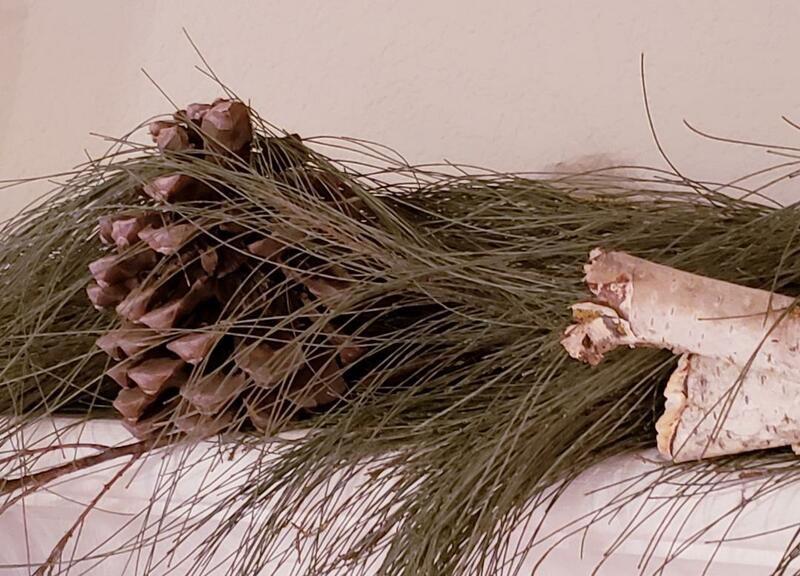 The pretty fresh greenery with the natural birch wood and pine cones looks so woodsy and beautiful to me. 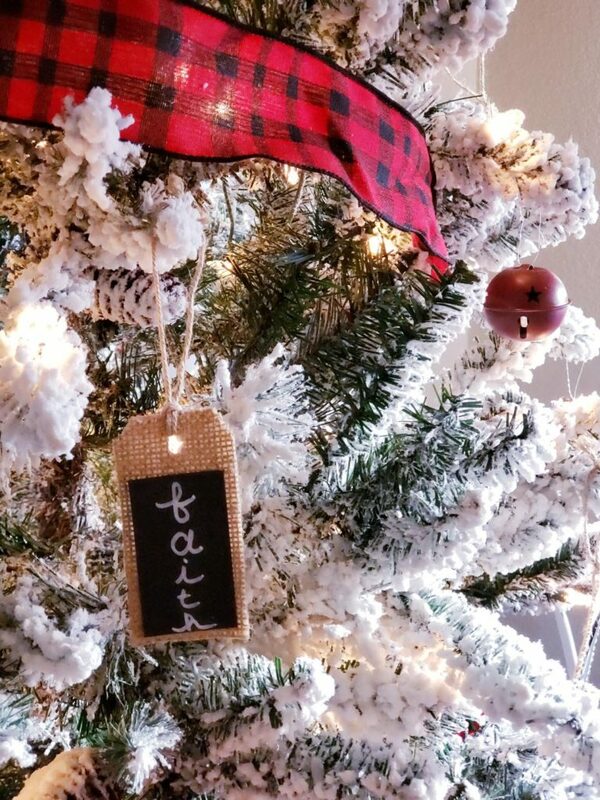 Then that white flocked tree with all of it’s farmhouse cuteness and sweet chalkboard ornaments as well as the precious treasured ones. 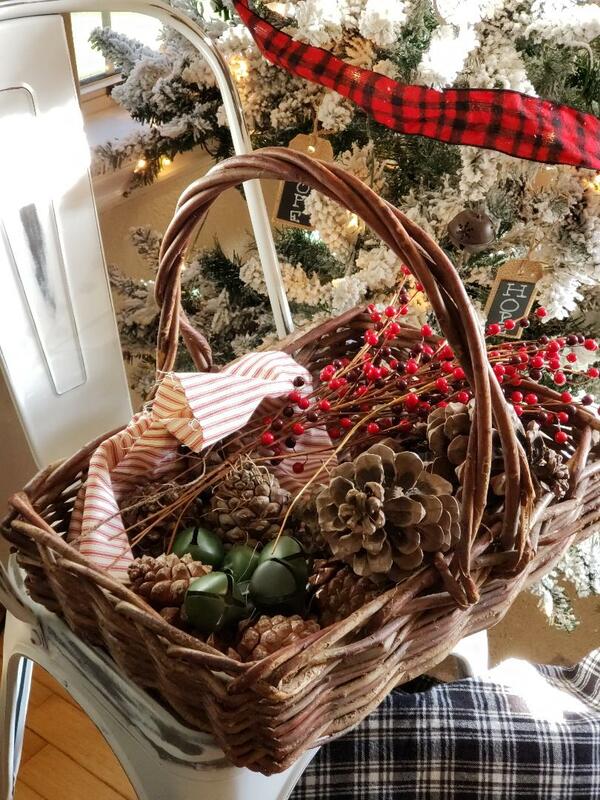 I hope you and yours are enjoying this season of bright lights, cozy smells, and wonderful traditions like trimming your Christmas Tree and decking the halls. Love it! I’m very familiar with White Christmas and have watched it every year since I was little. It’s not Christmas without having watched that! I started watching it yesterday but never got to finish it which totally isn’t fair! Oh yay! Another White Christmas fan! I knew I like you Tara and now I know why! Loved your post! I actually have never seen the movie, guess I’d better do that! I wish I could have real pine in my house but hubby is allergic. I do love all the ornaments from when my daughter was little though, what wonderful memories. I even have ornaments from when my husband and I were little, which is fun too. Merry Christmas! Oh what a treasure to have the ornaments you and your husband grew up with! And so sorry about his pine allergy. So I guess you’ve always had a fake tree? What a find on those tree branches! You definitely created the vision of White Christmas. 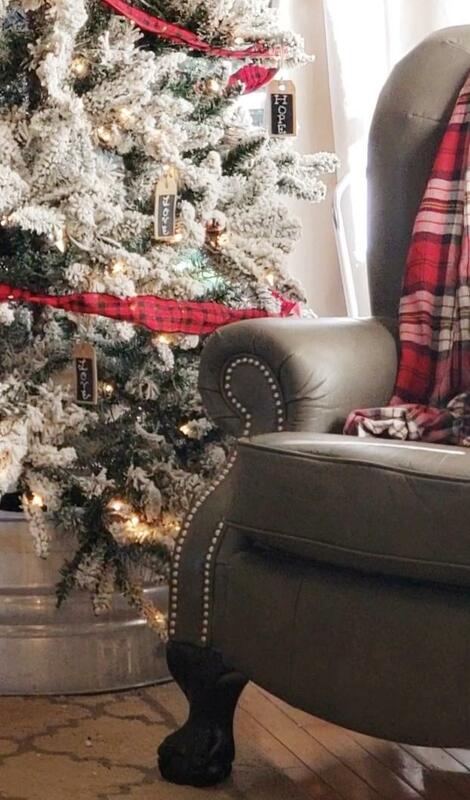 I still need to style around my tree and I think I will use some elements from outside to bring in like you did! 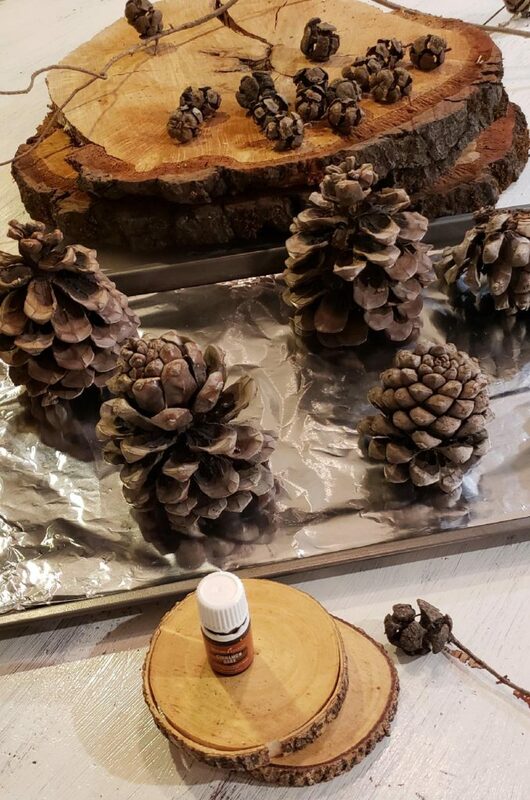 I also experimented with pine cones this year. They are fun to decorate with. Merry Christmas! Aren’t they?! Yes, I am really loving them scattered about and scented too with some essential oils! 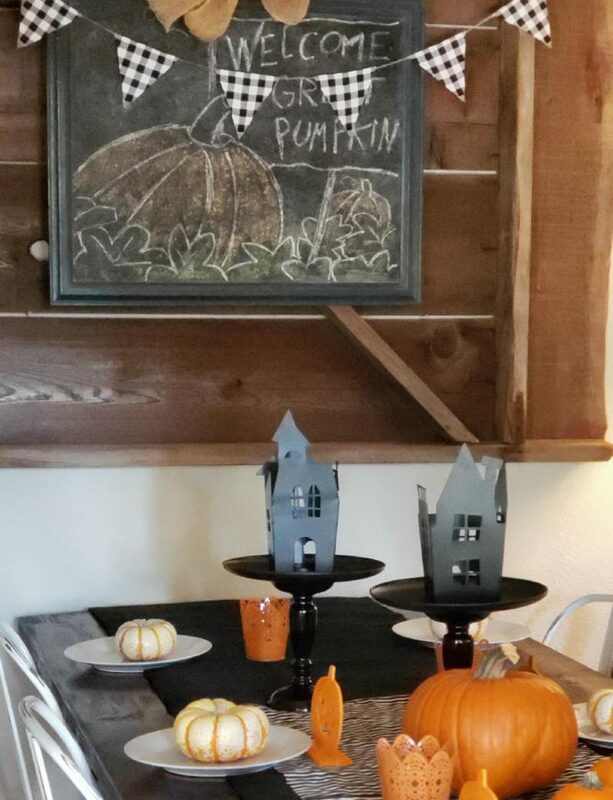 I have all the items to make the chalkboard ornaments! I’m definitely going to try and make some. I love them!! Everything you did looks amazing! How fun Cate! I’m so glad you liked them! You definitely accomplished your vision! 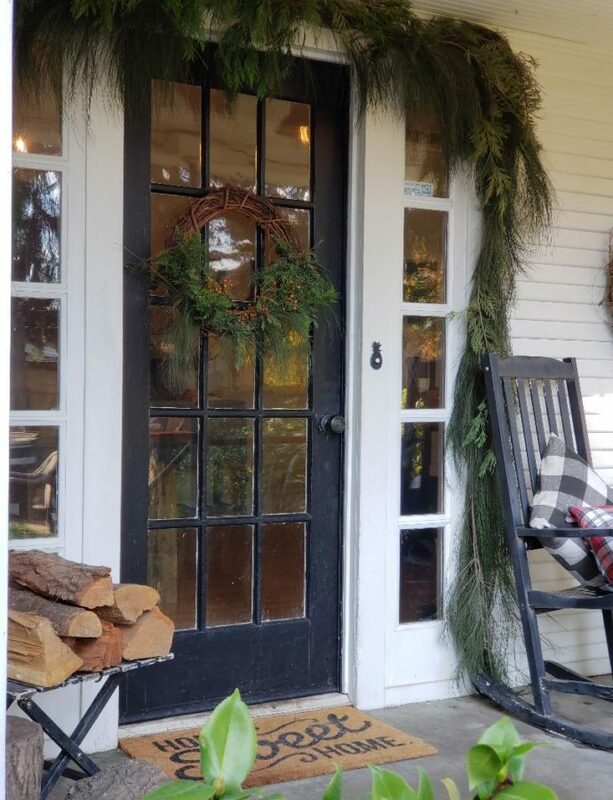 It is so cozy & welcoming & festive. Merry Christmas!